I was at the hospital when I saw this picture of a doctor. 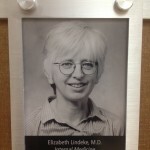 Ellen Degeneres has a cousin who is a doctor. They just have to be related. Do you think this looks like Ellen?